This site is devoted to microscopic images of minerals, thin sections of rocks and meteorites, spectroscopy of minerals and stereoscopy. Microscopy, mineralogy, photography and spectroscopy should be the keywords of this web page. You'll find therein my own collection of thin section slides manufactured from rocks collected in the field during walks. My purpose was not to make a systematic presentation of rocks under the microscope but simply to show some interesting images of minerals and rocks. The majority of the thin sections and polished slabs included here have been manufactured manually with glass plates and abrasive powders according to the suggestions of Mac Kenzie and Guilford in their atlas of petrography. I'm also adding images of sections I have bought. The sections of this site have now been renewed using Benford Plate for the Crossed Polars views (except otherwise indicated). This method allows to create Wide Field Images with a rendering much closer to what can be seen live through the microscope. This technique gives a better impression of the overall structure of the rocks without sacrificing the details. As an example, see this picture of an H3 Meteorite exhibiting a wide collection of different kind of chondrules. Due to the higher resolution, the size of the image files are higher, generally between 1.5 and 3MB. A chart is proposed to test the crosstalk of 3D monitors. (2015). Addition of home made devices for stereoscopy and mirror and prism stereoscopes (2016). Raman Microscope for the amateur mineralogist. 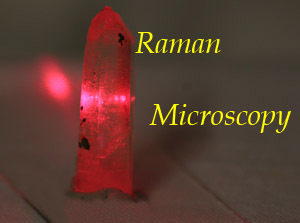 The purpose of these new pages is to show that with the optical components and detectors presently on the market, Raman Spectroscopy is no more a technique restricted to the professionals but amateur mineralogists and clubs can now think about the implementation of such an instrument for their own identification of minerals in rock sections and meteorites. A spectrograph (2013) has been build to improve Raman spectroscopy . A second laser (2014) has been added to the system to improve the detection of some highly fluorescent minerals. A NIR laser at 780 nm (2017) has been added. 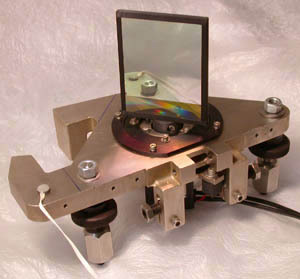 This laser can be used in case of strong fluorescence at the other wavelength. In addition of thin sections of rocks and meteorites, I have also included some convergent light pictures, an illustration of the measurement of the indices of refraction of small crystals with different techniques (in particular the phase contrast microscopy), a collection of stereoscopic photographs of minerals (anaglyphs) which can be viewed with color filter glasses and more recently the design of two microscope spectrometers which can be used to study the transmission spectra of small crystals of the thin sections in the visible and NIR wavelength ranges..
Last update : April 17th 2017.